"This recipe was shared with me by my friend, Sharon. She was given the recipe by her mother. 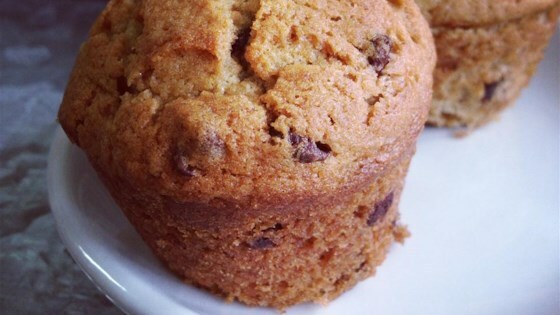 Everyone who has tasted them will agree that they are the best muffins ever!" Blend butter or margarine, sugar, egg, banana, dissolved coffee, and vanilla in food processor for 2 minutes. Add flour, salt, baking powder, and soda, and blend just until flour disappears. Add chocolate chips and mix in with wooden spoon. Spoon mixture into 15 to 18 paper-lined muffin cups. This is a wonderful banana muffin recipe. This is the only recipe I use!!! My husband can't wait for the bananas to overripen so he can reep the benefits with these muffins!!! Excellent!! !